Dergé (Tib. སྡེ་དགེ་, Wyl. 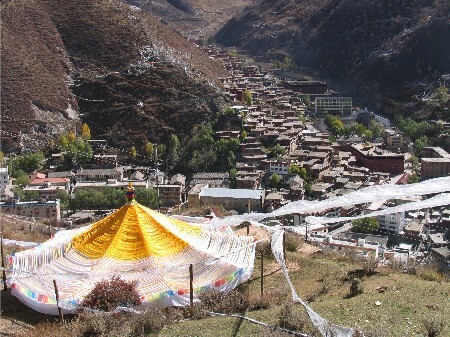 sde dge) — a region and also a town situated in Eastern Tibet. It was the birthplace of Dilgo Khyentsé Rinpoche and Nyoshul Khen Rinpoche, and is also the location of a famous printing house. The name 'Dergé' is often glossed as the place of the four aspects of wellbeing (Tib. སྡེ་བཞི་, sde bzhi) and the ten virtues (Tib. དགེ་བ་བཅུ་, dge ba bcu). Kolmaś, Josef. 'Dezhung Rinpoche's Summary and Continuation of the Sde-dge'i Rgyal-rabs' in Acta Orientalia Hungarica, vol. 42 no. 1 (1988) 119-152. This page was last edited on 29 May 2011, at 12:46.